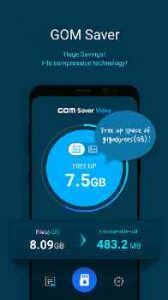 GOM Saver : built by the video experts at GOM & Company, with the goal to free up space more quickly and easier than ever on your phone. Cleaner apps temporarily save a few kilobytes (kb) clearing your cache, but GOMSaver can free up to gigabytes (Gigs), making a huge impact on your phone’s storage. GOMSaver is the first and only app that focuses on saving space on your phone. No more erasing apps and deleting videos, photos, etc. when your storage is full. With GOM Saver you can keep it all and add more! Other apps “Cleaners” just clear cache, and remove temp files. This only saves you a few kilobytes (kb) temporarily. Cache and temp files are automatically created when using your phone, such as browsing the internet and chatting. GOMSaver can free up space of gigabytes (gigs). You can feel like having another phone. By saving more storage space, GOMSaver allows you to keep all your files such as videos, photos, and apps. GOMSaver, automatically and easily, optimizes the videos and images you shoot with your phone so that they take up less storage space without any noticeable loss in quality by using compression technology. GOMSaver is for anyone and everyone that shoots videos or take pictures with their phones and needs more storage space. 2. Then GOMSaver selects videos and images to optimize. 3. GOMSaver will automatically upload your original videos and images in the cloud (Optional) and leave the optimized videos and images on your phone. And just in case, your original videos and images are safely stored in the cloud service of your choice! External storage(SD card) feature supported by over 5.0 OS. Essential Access Rights are necessary permissions that must be granted to use the app. Optional Access Rights if you do not grant permission, you can use the app, but there may be restrictions to the app. Required for displaying video / image files and information, and saving your optimized file from GOM Saver. I think that it is a great app for ushers that wanna free up space!! I can’t say anything about the app wouldn’t open. It lowers your media files size and let your Android phone breathe ! Does what the app description says…..no joke, I literally cleaned up nearly 6 GB of video and pics total on my SD card in just a short amount of time. The video quality of the videos once compressed is nearly identical to the original 1080 resolution. I did however pick up a few slight, perhaps barely noticeable “grain elements” here and there in the compressed videos, but it is not at all noticeable to the untrained eye, or a deal breaker at that. Besides, I have a backup anyway on the cloud created by the app if I ever needed a super crisp image. The photo quality once compressed is outstanding, with no noticeable elements. Super Awesome app, definitely a keeper on my phone! Great job dev!